A few days ago, I went back to Amai Tea & Bake House since everyone from the previous post about them, were commenting about trying out their scones and cookies. It seems strange that I came back so soon, but I was in the neighborhood and I was STARVING. I don’t know why, but I was. As you’ll see on the photo below, I went insane for pastries. I ended up with a vanilla bean scone, an Early Grey and currant scone, a green tea matcha cookie, white tea and strawberry cookie, and an almond chai cookie. Yeah, that’s a lot…along with a side of lavender butter for an extra fifty cents. The Earl Grey and currant scone was pretty interesting. It’s florally and light with a touch of spices and bergamot orange that is usually in this particular tea. The currants was a nice, slightly sweet, chewy touch to the scone. 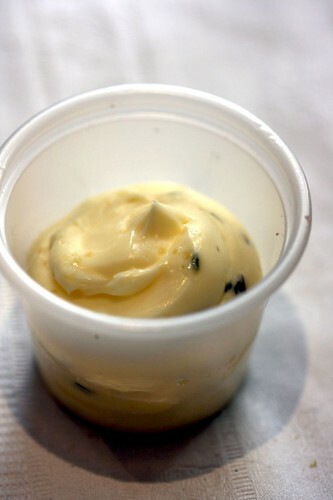 And the addition of lavender butter compliments the florally essence of the Earl Grey tea. The problem with the scone I had was that it’s a bit dry. 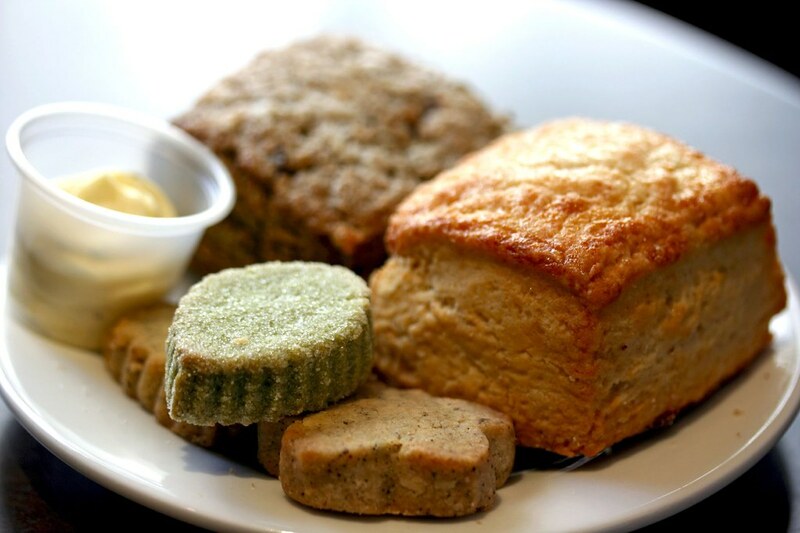 The vanilla bean scone is basically the typical scone. It’s delicately sweet, crumbly, and it has a hint of vanilla flavor. 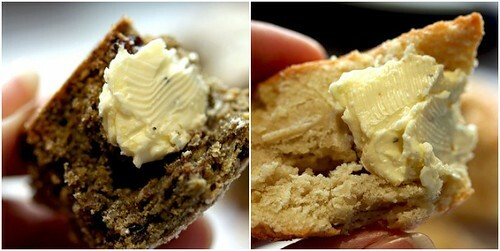 It’s nice with the lavender butter since the vanilla bean is the most versatile of the scones they have, but it didn’t blow me away. Also the problem with this particular scone is that it’s a tad under-baked in the center. All their cookies are basically shortbread-based; they’re all crumbly, buttery, lightly sweetened with different flavor variations. Of the three, the white tea and strawberry cookie was the most intriguing and tastiest. The white tea played a clean, delicate background flavor, not much of the grassiness that green tea normally would contribute, while the sweet strawberry flavor was bursting through a few seconds after the bite. The matcha green tea cookie was nice but I tasted more of a vanilla-buttery flavor more so than the green tea. And the almond chai tea was also good but nothing really stood out except it had a nice hit of chai flavor. I really do like Amai. The best thing I would go for after trying a whole bunch of sweets from the past two visits is the Roasted Sweet Potato puff pastry. I should correct myself about this particular pastry a bit from my previous post. Kelli told me that she was surprised that I said that I have tasted hints of spices, even though there weren’t any added at all. It’s just plain sweet potatoes from the Farmers’ Market down a couple of blocks east, and roast them in the oven to its delicious sweetness. That’s some sweet potato. Probably I should get some meself and make an awesome sweet potato pie for Thanksgiving…which isn’t too far away. 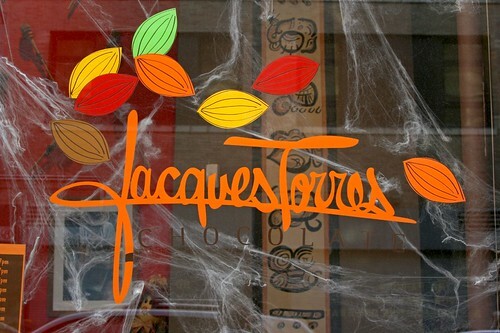 Then on Halloween, I went to Jacques Torres’ Chocolate Haven in SoHo. 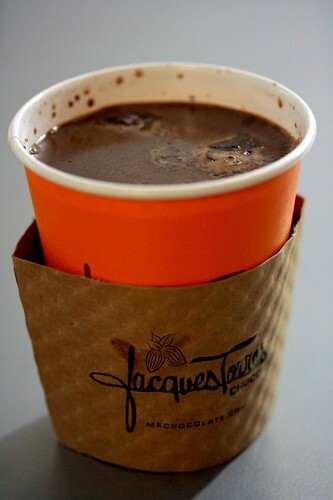 Lately these days, I’m having a huge craving for hot chocolate and it’s not even that cold. 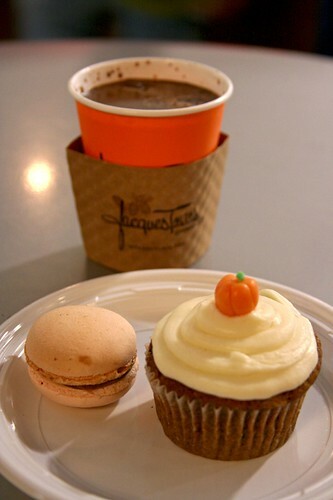 Nevertheless, I ended up going sugar happy again and got myself a caramel hot chocolate, a pumpkin chocolate chip cupcake, and a passion fruit macaron. I tried the hot chocolate first since that’s what I’ve been craving all day. It’s nice and warm, thick, but a tad too sweet. They’ve used a bit too much caramel sauce and the fact that not all of that sauce was dissolved, that I’m chewing bits of caramel in between sips. It’s pretty good but they need to reduce the amount of caramel. 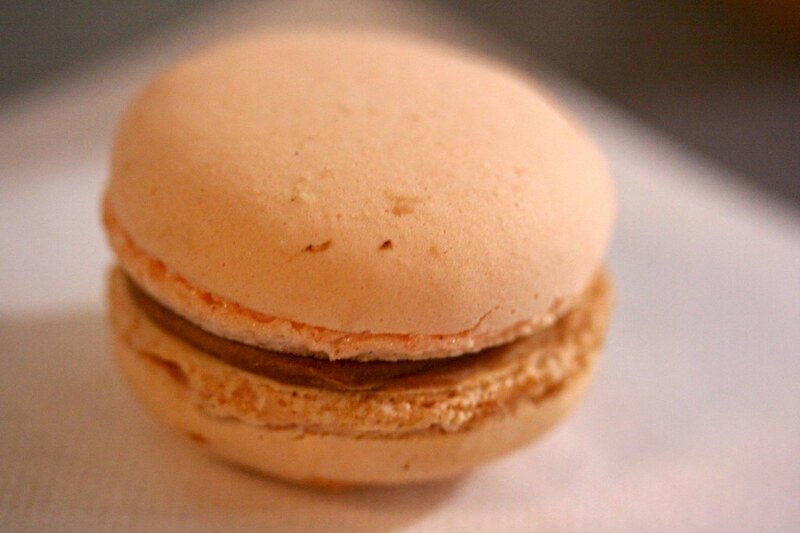 Then I went for the macaron. The last time I had it, it was pretty good: thin shell, moist innards, and it has a sweet and flavorful filling. But this was awful. It does have that thin, smooth shell but the innards are so dry. The filling is surprisingly a slightly insipid jam. This left me with a gaping hole of disappointment in my heart. My macarons hopes are getting dashed quicker than I expected. Then I dived into the cupcake. It’s very adorable and Halloween appropriate since usually one would think of pumpkins for this holiday. 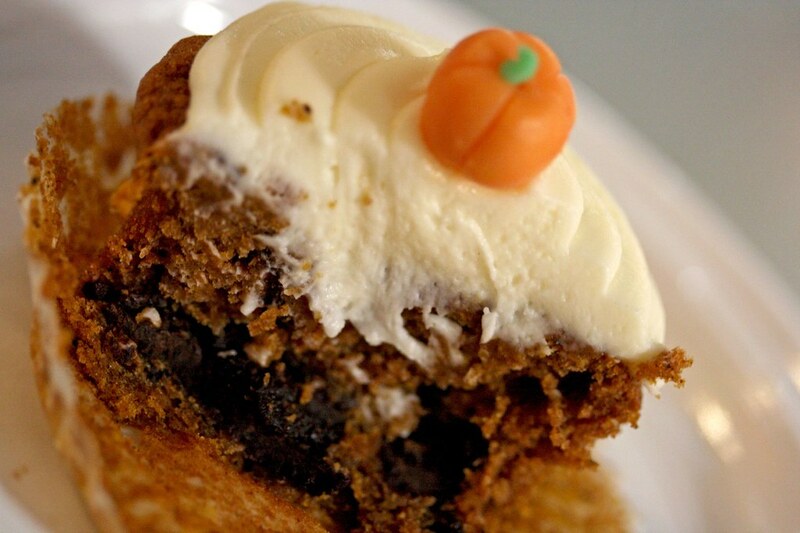 The cupcake was light, very moist, just sweet, a good pumpkin flavor with a hint of nutmeg and cinnamon to compliment the pumpkin. The chocolate chips were more like chocolate chunks that sank to the bottom of the cupcake forming a semi-solid layer of chocolate which made it a tad hard cutting with a plastic knife. 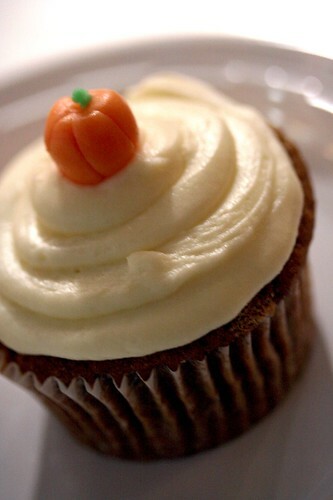 The cream cheese frosting was smooth, sweet and a touch of tartness to round out the cupcake, and it’s topped off with a marzipan pumpkin. How sweet. Arguably, this cupcake was the salvation of my trip here. Remembering the cookie that Robyn loves so much from her recent vacation from Italy and eating one at Serious Eats, I bought myself a bag. I fell into the hole of addiction ever since I opened this bag of chocolate lovelies; eating them two out of three meals within three days. Robyn’s right, it’s like eating potato chips. You eat one, you just can’t stop. Robyn, as much as I love you, I blame you for my obsession for these cookies! 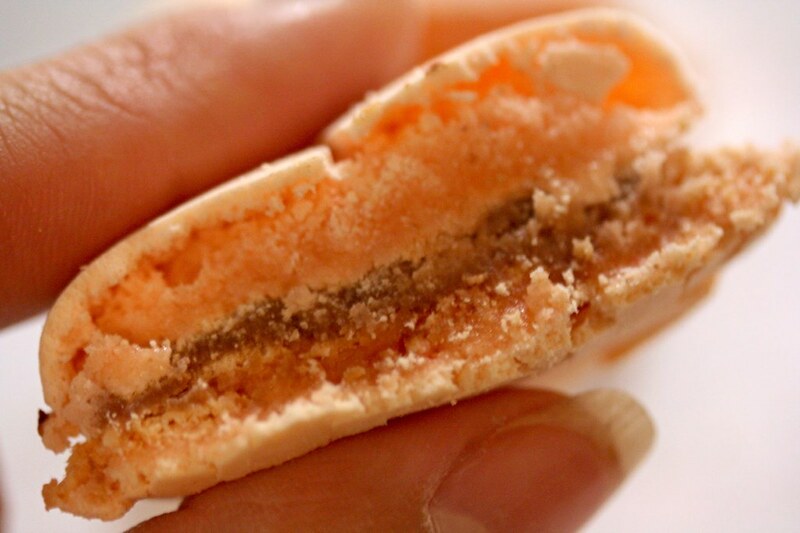 Pierre Herme macarons are one thing (since it’s so elusive getting one here in the States, it’s harmless) but this cookie is accessible, which is obviously a bad thing. 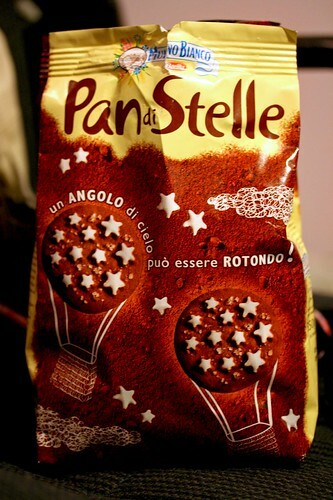 Ugh…is there such a thing as Pan di Stelle Anonymous out there? oh that cupcake looks so moist and perfect! and those cookies… man i need to move to nyc! 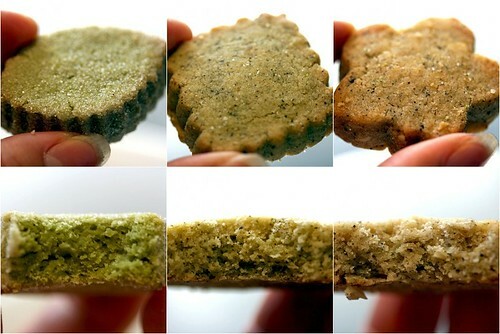 A green shortbread just looks so wrong, although I’m sure it’s perfectly delicious =D I haven’t eaten a cupcake since I was in 5th grade, but now I want! Amanda: The cupcake was awesome! The cookies were tasty; just some better than others, in my opinion. Dana: Well, the green shortbread, is matcha so it has every right to be green. Lacked the tea but you get the gist of what I wrote earlier. GO and get that cupcake before they’ll stop making them! 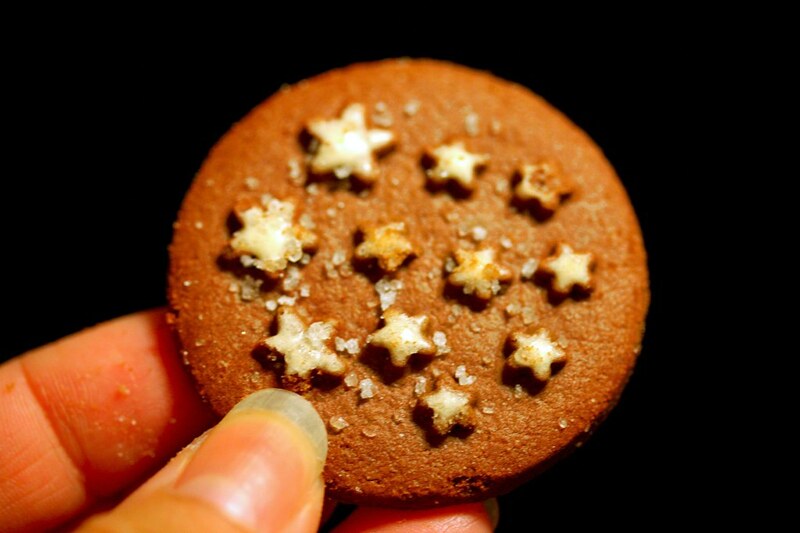 Oh man, must get hands on these ‘star’ cookies everyone is talking about! Anyways, you don’t have to get the Pan di Stelle cookies since I’m lugging them to your place with all my other stuff. oooh that cupcake sounds delicious. i have to go try that one too. “Happy Birthday Tina!” May this year’s be among your best ever! I discovered you recently back in August and I really enjoy your writing. You’ve a wonderful style that allows the readers to really share in your joy… I like that! my sister is a pastry cook there (her friend is the head pastry chef and my sis just works there 2 days a week in between her restaurant gig)!!! Mmmmmmmmmmmmmmmmmmmmmmmmmmmmmmm! PAN DI STELLE! I used to work at a little gourmet Italian store where they sell them. Suffice it to say I was a pan di stelle-aholic.